Sweeney Hall houses classrooms, computer laboratories, research and teaching laboratories, and departmental and staff offices. Sweeney Hall is located at 618 Bissell Road on the northwest side of the ISU campus. Building hours are Monday-Thursday 6 a.m.-midnight, Friday 6 a.m.-10 p.m., Saturday 8 a.m.-10 p.m., Sunday 8 a.m-midnight. Find Sweeney Hall on the Iowa State University campus map. Conduct research in Sweeney Hall laboratories. The instructional laboratories and additional faculty offices and research laboratories are located at the west end of Sweeney Hall. Take a look at the equipment in the laboratory area — you will probably see some equipment familiar to you, and you can find out about the unfamiliar items by asking any faculty member. You are invited to stop in at any of the research labs and ask about the research work in progress. Sweeney also contains a unit operations laboratory for undergraduates, where students conduct experiments in material and energy balances, momentum and energy transport operations, and thermodynamics. Click images below to preview some of our laboratories. Research also is conducted in several interdisciplinary centers on campus. 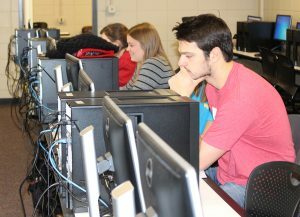 Computer labs are open longer for students. 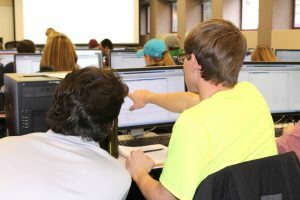 The Department of Chemical and Biological Engineering has a growing list of computer resources in Sweeney Hall available to undergraduate students, with 150 computer work stations. This includes the Reginald R. and Jameson A. Baxter Computing and Collaboration Lab in 0104/0108 Sweeney and a new multimedia student computation and collaboration center in 2123 Sweeney (fall 2016). See the College of Engineering IT site for troubleshooting information. Quiet study areas are also available in Sweeney Hall.